Berwick Rangers leapfrogged Annan with a deserved two goal victory at Shielfied Park on Saturday . It proved to be a miserable afternoon for Annan who failed to seriously test keeper Michael Andrews with a dreadfull performance which left manager Jim Chapman fuming. The early warning signs were evident with Alex Mitchell pulling of a save to deny Lavery in the opening minute and the Annan keeper had to be on his toes to deny Hoskins in the 8th minute after a Black slip presented the opportunity. Hoskins pulled out another stop by Mitchell in the 16th minute when the Annan keeper turned his effort for a corner kick. Annan’s first real attack in the 20th minute resulted in Martin McNiffs cross causing concern in the Berwick defence with Flynn failing to control the cross. Annan forced a couple of corners mid way through the half with Weatherson’s header from Hopkirks corner landing on the top of the net. Annan had a let off in the 35th minute when Steven Black was disposed and from the resultant cross Notman tucked the ball in the net only for the goal to be chalked offside. Minutes later Steven Logan’s effort from the edge of the box sailed over the bar. As the game approached half time Black conceded a free kick 22 yards out but Lee Currie’s disappointing effort failed to hit the target and a good opportunity was squandered. 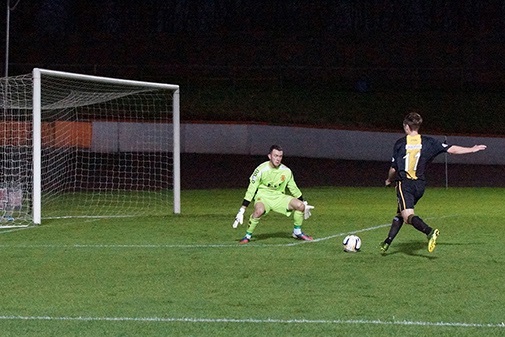 Berwick were pressing hard for a goal and Mitchell pulled off saves to deny Currie and Willis. Berwick made a promising start to the second half and Currie squandered a clear chance in the 46th minute with Mitchell once again thwarting the attempt at goal. Mitchell was once again called into action in the 58th minute when he tipped Hoskin’s header over the bar for a corner kick. It only appeared a matter of time before Berwick scored and when Lavery shot straight at Mitchell in the 62nd minute from a glorious position Annan’s luck appeared to be holding but a minute later Berwick went ahead after Todd lost possession and a first time ball from Dargo released Lavery in on goal who rounded keeper Alex Mitchell to tuck the ball into the empty net . Willis could’ve made it 2-0 after being played through by Lavery but his shot was turned away by Mitchell and, as Berwick looked to hang on to their lead, Scott Dalziel and David Gold were brought on in place of Lavery and Dargo. Berwick sealed the win in the 88th minute. Drummond got to the byline and pulled the ball back for Willis and when his shot was blocked on the line, the ball rebounded to Currie who made no mistake from close range . BERWICK RANGERS : Michael Andrews, Devon Jacobs, Ross Drummond, Jonny Fairburn, Ken Young, Dean Hoskins, Paul Willis,Lee Currie, Craig Dargo (David Gold 87 min), Steven Notman, Darren Lavery ( Scott Dalziel 80min). Substitutes Not used Ross Gray, Dean Horribibe, Andrew Russell, Colin Cameron, Craig Wight GK. ANNAN ATHLETIC: Alex Mitchell, Steven Black, Iain Chisholm, Martin McNiff, Peter Watson, Steven Sloan (K Brannon 69 min), Matty Flynn ( Scott Davidson 80 min) ,Steven Logan (Ryan McStay 80 min), Peter Weatherson, David Hopkirk; Josh Todd. SUBS NOT USED: Rabine Omar, Jordan Brown, James Gillan, Craig Murray.